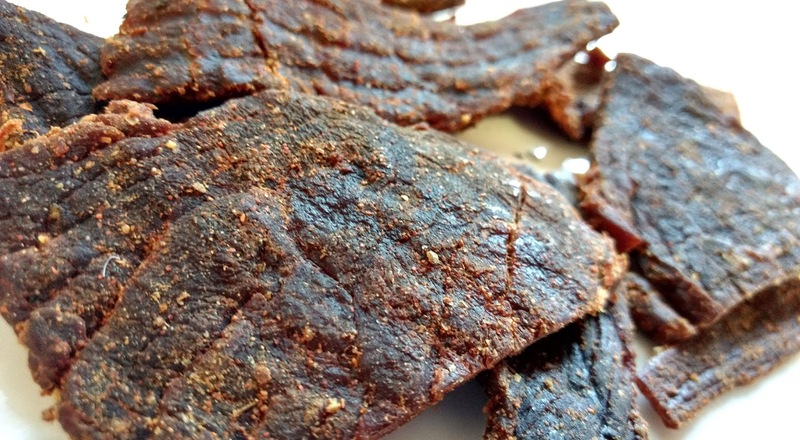 Genius Jerky was founded by Richard Plebuch in 2012, based out of Lovettsville, VA. Plebuch has long held an affinity for the culinary arts and in 2009 began pefecting recipes for jerky. 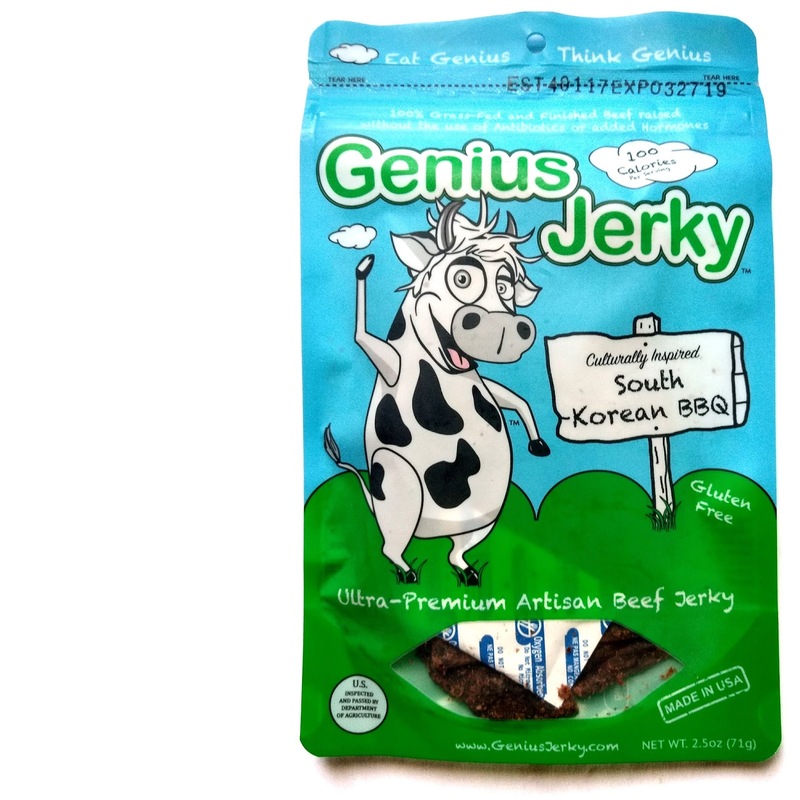 After raising funds through a Kickstarter campaign in 2016, Genius Jerky has been selling in markets throughout Virginia and Maryland, as well as from its own website. 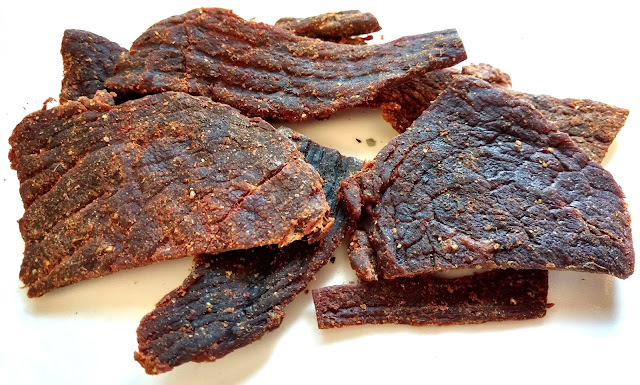 This South Korean BBQ beef jerky is described by the company as, "Sweet and smoky with a hint of warmth", going on to say that it pays homage to traditional Korean Street BBQ with, "...notes of honey, garlic, soy, and sesame". 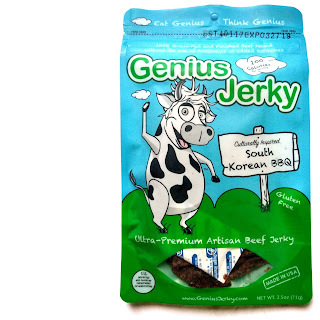 100% Grass-fed and finished Beef, Reduced Sodium Gluten-free Soy Sauce, Organic Gluten-Free Hoisin Sauce, Honey, Sriracha, Rice Wine Vinegar, Roasted Garlic, Garlic Powder, Spices, Sesame Oil, Himalayan Pink Salt, Vinegar Powder, Celery Powder. The first flavors that hit my taste buds are a light sweet and faint smoke, with touches of salt. A light vinegar flavor comes in along with touches of tomatoey sauce. The chewing brings on some garlic and onion. For being dubbed, "South Korean BBQ" it's hard to say if I'm getting anything that reminds of Korean style BBQ or anything Asian. It's moderately sweet, and it has a sauce flavor that hints of tomato with touches of spice. All the Asian-ingredients listed in this, such as the soy sauce, the Hoisin, Sriracha, rice wine vinegar, and sesame oil, are all hard to identify. If anything, I can faintly pick up the Sriracha's pungent garlic, chile pepper, but that's really it. Otherwise, the primary taste profile is a moderately sweet, tomatoey sauce with garlic, onion, and chile pepper seasonings, along with touches of vinegar. It's lightly spicy, but not hot at all. It's still rates as "mild" on our heat scale (level 1 out of 5). The meat consistency is excellent. These appear to be slices of pure meat, with little to no fat visible. They are soft and easy to chew. They have a meaty nature, but not quite a steak-like texture. They tend to be a tad mushy. This South Korean BBQ from Genius Jerky dishes out a complex blend of seasonings and sauces that mix together to create a tomatoey profile with garlic, onion, and chile pepper seasonings. While it does have a touch of spiciness, it's still overall mild, and suitable for most tolerances. Despite the varied use of ingredients, it doesn't come off as intense or overwhelming, but as a unique marinade unto its own. Meanwhile, the easy moist chewing creates a lot of snackability and lends itself to non-stop face-stuffing.